The times they are a-changing. Back in the late 90’s we wrote a few op-eds about how for wine to reach more customers it had to break out of the glass bottle closed with a cork or stopper. Since then Tincknell & Tincknell has been working with companies to bring wine forth in all sorts of new, alternative, innovative, creative packaging. As noted before here, we helped Black Box – the first fine wine 3-L boxed wine in the U.S. – along with many smaller companies that have given it the go. Some of those efforts succeeded (Black Box, obviously), others provided the ground work for later success (Blackburn, launched by Delicato Family Vineyards, are now leaders in fine wine 3-L boxed wines with their Bota Box wines), and others that made a valiant go, were ahead of their time, and are fondly remembered by their fans (and us). T&T are still helping to get boxed wines started, and interest remains high in the package from both consumers and wineries. Sales of 3-L boxed wines were up 19% in 2010, and 16% in 2011 – pretty impressive. There is still plenty of room for more 3-L boxed wine brands. The 2013 Unified Wine & Grape Symposium was held this week, the highlight being two days of the industry’s biggest trade show. Among the vineyard and winery equipment are many packaging supply vendors, from bottles to boxes, and much much more. The much much more is what is becoming the most dynamic sector in the wine industry. The “successor” to the 3-L boxed wine could be claimed by the 3-L rigid pouch, of which Astrapouch is a leading vendor. Clif Family’s The Climber wines are one of the more prominent brands on retail shelves. Along with the rigid pouch, more flexible pouches in various sizes are debuting. 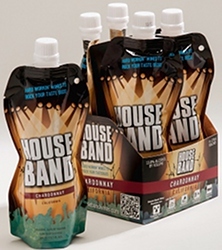 Tincknell & Tincknell assisted the launch of House Band Wines’ flexible 375-mL wine pouch closed by a screw cap (shown on our Alternative Packaging web page). Virtually indestructible, it provides a convenient package for those situations where glass or larger volumes aren’t practical: beach, camping, music concerts and festivals, picnics, sports games and tailgate parties, etc. For House Band Wines, the wines are sold as individual pouches or in 4-pack retail cartons, the latter equaling two 750-ml bottles of wine. Astrapouch displayed 3-L rigid pouches at Unified, as well as 1.5-L, 375-mL, and 187-ml pouches, along with prototype filling equipment for the small-serve flexible pouches. Tincknell & Tincknell have proposed to assist Astrapouch with developing unique design work for future brands, either as brand extensions or new pouch-only brands. Sharing Astrapouch’s Unified trade booth was one of the more innovative wine keg delivery systems on the market by Torr Industries. Instead of using gas to force wine through a dispensing system (like a tap in a bar), Torr uses air to compress a bladder that squeezes a 9-L wine bag into the dispenser – eliminating any potential issues from wine coming into contact with nitrogen (which can, if not properly calibrated, add a little spritz to a tap-poured glass of wine) or oxygen (which would oxidize the wine). The on-premise establishment either buys or leases the Torr keg and air compressor units (or a winery could subsidize them too), and the winery sells and ships the 9-L bags of wine in simple corrugated cardboard cases to the on-premise account. The keg never gets dirty – since wine is never in the keg, but in the bag in the keg – and only the 9-L bag needs to be exchanged. 9-L’s of wine is only a little over 10 lbs. in weight … versus the 35 – 40 lbs. that a case of 12 750-mL glass bottles normally weighs. Furthermore, just like the 3-L boxed wine, the wine stays fresh from first glass to last in the Torr wine keg dispenser. Alternative wine packaging also now has its own star in James Martin of Copa di Vino. The company’s single-serve, 187-ml wine glass has been growing at a fast rate both in number of markets and cases. The company will be expanding selection and launching a new glass shape in the future. So what does this all mean? Wine is finally joining the other beverage markets, both alcoholic and non-alcoholic, in providing convenience packaging. In 2011 6% of all wine in the U.S. was sold in non-glass containers. The one-size-fit-all 750-mL glass bottle isn’t going away, but it has been changing too – with the burgeoning growth of screw-cap closed wines. (And let us acknowledge the few sparkling wines that have dared to sell with crown caps instead of cork or stopper closures). But for wine to expand in the market it had to become, and needs to become even more convenient. Younger generations are not as concerned with packaging traditions when it comes to enjoying wine in casual social situations. They want to be able to enjoy wine more easily in those times where wine is appropriate, whether it is a casual evening together and boxed wine provides the convenience, or whether it is in a situation where the package must also be the drinking vessel as a plastic wine glass, Tetra Pak®, flexible pouch, plastic bottle, aluminum bottle, or aluminum can. Alternative wine packaging is also meeting a contemporary issue head on; whether one subscribes to climate change, many consumers are very focused on being environmentally friendly, and alternative wine packaging is much more so than glass. Lighter weight, more recyclable materials, and different volume configurations that maximize packaging materials are some of the ways alternative wine packaging can be more eco-friendly. Innovative wine packaging can also be more cost effective, providing savings to either or both consumers or producers, once production is at optimum efficiency. That isn’t to say Millennials are abandoning wine in cork-finished glass bottles; market feedback from packaging T&T has produced and marketed clearly show that the younger generations respect and admire the traditions of the traditional wine package, and feel it is a must for high-end super-premium, ultra-premium, and luxury priced wines. Furthermore, natural cork has the edge for sealing wine for cellaring; screw caps may be as effective, but trials in aging great wines closed in screw caps are still few. Natural cork’s ability to keep wine properly sealed for years is pretty remarkable, and still the most viable, proven solution. In T&T’s crystal ball into wine’s future, the next big brands in wine will be the one that is the most convenient for wine drinkers to enjoy, in the package right for the time and place. Over the last 15+ years T&T has been working with start-ups and established wineries on 3-L bag-in-box, aluminum bottles, plastic bottles, single-serves, and flexible pouches. In working with alternative wine packaging, many challenges remain on both the production and the marketing sides. In production, packaging costs and co-packing remain challenging. In marketing, the established three-tier sales channel often doesn’t understand the new markets alternative wine packaging opens for them, nor are nimble enough in inventory management and sales to accommodate just-in-time sales for the shorter shelf-life alternative wine packaging has. But the explosive growth of alternative wine packaging, and the enthusiastic embrace by new and young wine drinkers is impossible to ignore: wine’s future is beyond the glass bottle.